The Silver Route is part of the Tentative list of Spain in order to qualify for inclusion in the World Heritage List. After having cycle the Camino Frances ( Route of Santiago de Compostella - WHS) in Spain in 2012, I went cycling for another long trip along the Via de La Plata (The Silver Route) in september 2014. The Via de la Plata is another way of Saint-James in Spain, getting from Sevilla to Santiago. It is far less travelled than the two main ways (the Camino Frances and the Camino del Norte – both WHS). It means fewer pilgrims and longer stretch of solitude. In a way, it makes it more valuable and enkoyable. It is as well organized as the other ways. Well marked, and with many pilgrim’s hostels (albergue) all along its way. Most people would agree that it is best to hike the main Camino Frances for a first experience on the Saint James way. The Via de La Plata is much more rewarding, but is better enjoyed as a second experience. There is some confusion about what is exactly is the Via de la Plata. On the TL description, it seems to consist of the old roman road from Ayamonte, through Merida and then north to Astorga. Some people would like to extend it to Gijon in the north or have it start in Sevilla. For more confusion, there is two parallel ways named Via de la Plata : the roman way and the Saint-James’s cultural pilgrim’s way. They often merge or criss-cross, but can diverge for long stretches of the itinary. In the Extremadra province they are marked with different stone markers, yellow for Saint-Jame’s and green for the old roman way. I went along the Saint-Jame’s way, following the yellow arrows (the Roman way being sometimes not passable). I started in Sevilla, going north and visiting Sevilla, Merida, Caceres and Salamanca WHS on the way. I left the Via de la Plata north of Zamora, to take the Camino Sanabres to Santiago. Altogether, it is a 1000 km itinary, mostly on tracks or dirt roads, avoiding busy roads and traffic. It took me 14 days to complete this way. As a reminder, the way’s of Saint-James can only be done hiking, cycling or horse-riding. Hikers usually take a month to complete this way. 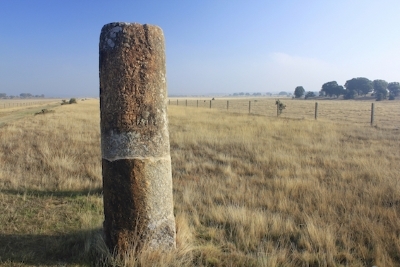 Along the road, there are often old roman milestones (see the picture). In the middle of the way is the emblematic Arco de Caparra, an old victory’s arc still standing on the site of an old roman city. Some roman bridges are still standing and are still in use (like in Merida). But for me, the most significant feature of the Via de la Plata is the succession of the magnificient landscapes passed on the way, changing as I moved northward in the Iberic Peninsula. In Extramadura, the landscape consists mainly of dehesa (a multifunctional, agrosylvo-pastoral system that might be on the TL as a cultural landscape soon). But it is also the pilgrims met along this way, all going in the same direction, but with all kind of different objectives (mostly non religious) and the always friendly locals, quick to stop me when I happened to have lost my way. As for OUV, I am a bit skeptical. Most of the way has disapeared, and some stetch are heavely restored. However, compared to the success of the Lime’s project (the frontiers of the Roman Empire), the Silver road would stand on an equal chance. It could also have a chance as an extention of the Routes of Santiago de Compostela WHS.